It is a truth universally acknowledged, that a person in possession of a quantity of blueberries, must be in want of baked goods . Having acquired blueberries and converted some of them into desserts, we set our sights on things breakfasty, and commenced The Muffinning. 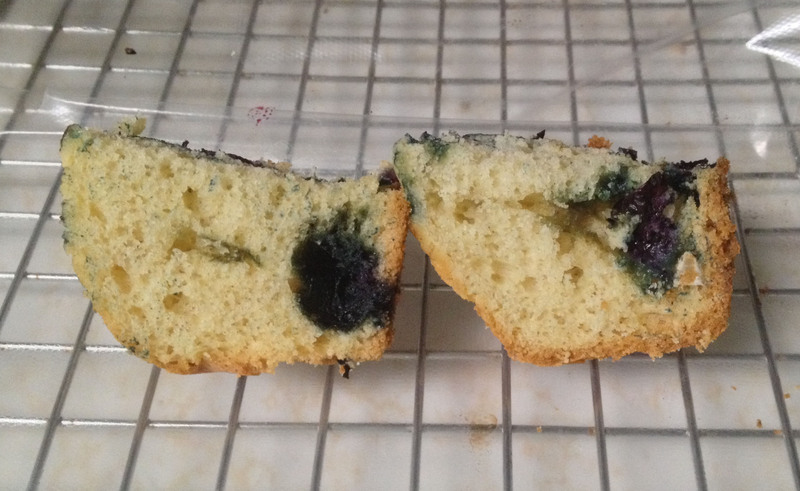 The folks at King Arthur Flour provide an excellent recipe for blueberry muffins. Their baking tips note that frozen blueberries can be used as is, without first thawing the berries, although this will require a bit of extra time in the oven. Given a variation in blueberry state and bake time, this seems like a perfect opportunity for some baking science. Two questions present themselves: Does the use of frozen berries cause a noticeable difference in the finished muffins? If so, which is preferable, the fresh berry muffin, or the frozen berry model? The recipe makes a dozen muffins. We will end up with six containing fresh blueberries, and six whose berries were frozen. For testing, we had a total of seven tasters each of whom sampled half of a muffin of each variety. Three of the tasters reported a definite preference for the fresh berry muffins, indicated that they found those muffins to be sweeter. Blog co-founder A also reported a preference for the fresh berry muffins. Of the remaining tasters, one (co-founder F) preferred the frozen berry muffins, describing them as sweeter. The remaining tasters had no preference or could not pick a favorite, though one identified one muffin’s berries as being “gushy”, while the other berries were not. Examination of the muffins themselves reveals a difference in the rind on the base of muffins. As seen in the photo below, the muffins containing fresh berries (pictured on the left) have a thinner rind than those which contained frozen berries (on the right). It is possible that this stems from differences in baking time, and that it is responsible for at least some of the perceived flavor differences, though this will require further study. Comparative Muffinning. Fresh-berries muffin on the left, frozen on the right. Note the thicker bottom layer on the right. The use of fresh versus frozen berries in a muffin does seem to produce a noticeable difference in the final muffin, though there is some disagreement as to which berry state produces the better muffin. It is possible that the difference results form differences in baking time between the muffins, though this requires further testing. However, the difference between the muffins does not seem to be great enough to prevent tasters from happily eating muffins for science. Some, but not all, of the tasters were consuming brandy during the taste test. As these tasters also reported different preferences among the muffins, further study is needed to determine whether the brandy altered their perceptions or they simply preferred different muffins. The longer cooking time required for the frozen blueberry muffins may also have had an impact on preferences. Therefore, it may be interesting to repeat this study using still-frozen blueberries and blueberries that had been frozen and subsequently allowed to return to room temperature before being incorporated. The recipe we used also notes that the batter keeps well in the refrigerator for up to a week. As prolonged time the in fridge is not necessarily the best thing for food stuffs, it would be interesting to make a batch of muffins, bake some of them immediately and refrigerate the remaining batter for a while, to see if delayed baking has an impact.